July 8 Update: Your grades are in the system. 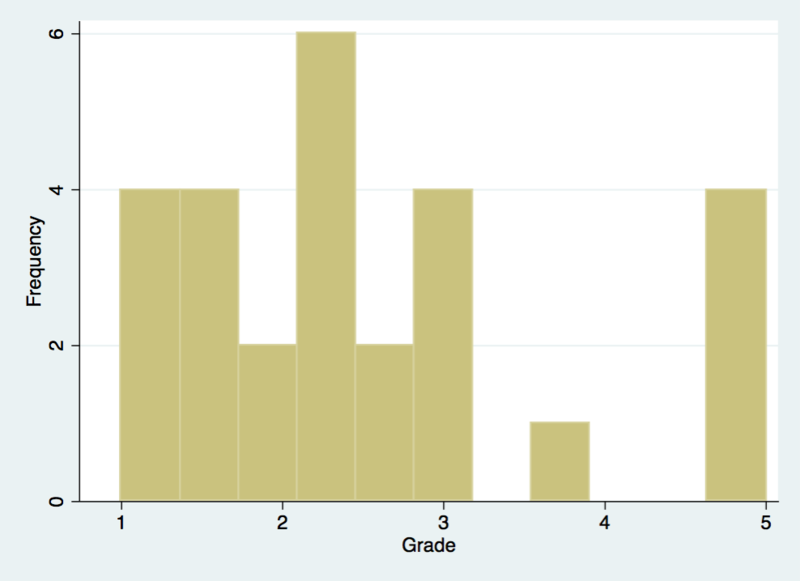 See the grades distribution below. You can see your exams on Wednesday, July 18 at 4pm in my office. May 15 Update: There is a mistake in the syllabus. For lecture 6 you should read Ray, chapters 6 and 8. Not 6 and 7 as it is in the syllabus. Sorry! May 14 Update: To catch up with this weeks tutorial topic we will postpone the lecture on foreign aid to May 28. The remaining program remains as planned. Thank you for your understanding. April 13 Update: Please, note that there was a mistake in the link to the compressed readings file. Now the link is correct. I have also added a link to Stata 12 version of the datasets we used today. March 23 Update: Dear students, our class begins soon. We will start the replication exercises using Stata already on Friday, April 13. We start with a paper by Mankiw, Romer, and Weil: A Contribution to the Empirics of Economic Growth (1992). Please, make sure to read the paper before the class on Friday. You can download the most recent version of the course syllabus here. Please, before asking me questions about the logistics of the course, try to find the answers in the syllabus. Most likely you will find the answers there. Please, find the readings here. The password will be provided in the lecture. I did a mistake that I used the population data instead of the workers data in order to calculate the n. Now corrected. There is another mistake in the handout: the link to the Barro-Lee data is actually this. Now corrected. Bonus points go to ones who generate the working population data using the UN Population division database.